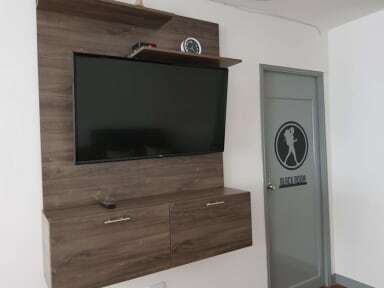 Our Hostel, In Backpackers Inn Medellin, in addition to providing comfort to its visitors, offers a privileged location and easy access to public transportation to connect with the City by Metro(subway). We are located in Laureles, one of the best neighbourhoods of Medellin. We have an excellent service, modern rooms, entertainment area, BBQ and a large kitchen to share. We are located in Laureles, one of the best neighborhoods of Medellin in range to important shopping centers like Unicentro, chain stores like Exito and D1, universities like Bolivarian Potifical University, restaurants like Orale, Mondongo´s and Los Chamos, bars like Oye Bonita, banks like Caja Social Bank, parks like first and second Laureles Park it´s also a quiet and secure neighbourhood. We have an excellent service, modern rooms, entertainment area, Wifi, data-phone, BBQ area, hot water, a large kitchen to share, outdoor spaces, hammocks, good breakfast and everything you need to rest in optimal conditions. We have two types of rooms: 2 private rooms and 4 shared rooms, the ones that are shared includes 6 or 8 beds, private bathrooms for each room that comes with toilet paper, soap and towel, we also offer, a fan for each room; and linens, pillow and blanket for each bed. One of the shared rooms with 8 beds (Red Room) is only for women and one of the shared rooms with 6 beds (Silver room) includes a private balcony. The standard private room includes a double bed and a bunked bed, private bathroom with toilet paper, soap and towel; a fan, linens, pillow and blanket for each bed. And the deluxe private room includes 2 double beds, private bathroom that comes with toilet paper, soap and towel; a fan, linens, pillow and blanket; including Tv, bedside table and reading lamp. Every room includes breakfast and has a colour theme for each one. Great hostel. Amazing staff. Andrea and Diego were the best. Friendly and social environment. Made great friends. Quick walk to the metro and multiple grocery stores around. Some things could be improved. The internet was really slow at night when everyone was one it. Might help to have another router. When the hostel was full it could be hours before you could use the kitchen (only happened two nights out of our nearly 2 week stay) Would recommend. This place was awesome! Really wished I had spent more than one night here, and would without hesitation book stays at this hostel if I went back to Medellin. The hostel is really nice, set up in a great way in a nice location. There are a ton of things to do here asa solo traveller or in a group of friends. Nice place, friendly staff, good location if you are seeking out of the touristic area of Medellin and want more authentic, local experience of the city. Noisy fan in the room, but personally did not bother me. Quiet, keep to yourself kind of hostel the time I was there. Simple, decent location and has all you need. Clean and tidy as well. location is great. seemed like a nice place to hangout with an outdoor area and indoor area. the only real problem was that the room was incredibly hot at night - couldn't sleep at all, had to go downstairs and sleep on the couch in the common area. wasn't a hot night in medellin, so i don't know how it gets so hot in the rooms. Really quiet hostel. Perfect if you just want to relax. Definitely not somewhere you go to socialize. It was pretty clean, the beds were comfortable and there’s a really nice patio with a mango tree that drops ripe fruit every hour. WiFi is decent but definitely doesnt reach every room. The staff is really quiet but attentive. Overall a really calm hostel but great location and value for the price. The good: Very chill hostel with nice courtyard, and good location in Laureles. The bad: little to no atmosphere or socializing, no events, the staff didn't explain anything to me really when I checked in, including location of lockers, if breakfast was included, how to unlock the front door to leave. For the price I could have paid $USD5 a night and stayed in an Airbnb. If I am paying for a hostel I want the social experience, breakfast, and some events. The beds were also very uncomfortable.